Add NFKB cRel polyclonal antibody - Classic to my shopping cart. Request a quote for a bulk order for NFKB cRel polyclonal antibody - Classic. Please fill out the form here below. Your local sales account manager will get in touch with you shortly and send you a quotation based on your requirements. Polyclonal antibody raised in rabbit against NFKB p50 (NFKB1), using a KLH-conjugated synthetic peptide. Western blot of HeLa cell extract. All incubations were performed using TBS supplemented with 0.1% Tween-20 at room temperature. The membrane was blocked in 5% dry milk for 2 h. After washing, a:1:1,000 dilution of the primary antibody was added to the membrane and incubated for 2 h. Washes with buffer were performed 4 times for 5’ each. 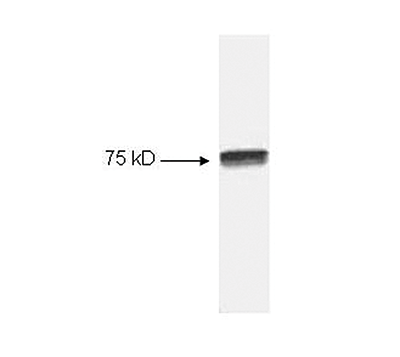 The western blot was incubated with secondary antibody (HRP Goat anti Rabbit IgG) diluted 1:2,000 for 1 h.
Diagenode strongly recommends using this:	NFKB cRel polyclonal antibody - Classic (Diagenode Cat# C15310257 Lot# 001). Click here to copy to clipboard.